My Name is Yadanar and I am Young Women’s Coordinator from YWCA of Myanmar. Thingyan is the Myanmar New Year Water Festival and usually falls around mid-April (the Myanmar month of Tagu). It is a Buddhist festival celebrated over a period of four to five days culminating in the new year. This year of 2015, Yangon police announced on March 30 that they would arrest owners of pharmacies or other shops found to be selling emergency contraceptives, birth control pills or medicines for erectile dysfunction(Please click here for more). Pharmacy owners were forced to sign pledges not to sell the medicines before and during the water festival, including products registered with the Food and Drug Administration (FDA). In some areas of Yangon, pharmacies are not allowed to sell even condoms because police told them not to. In some areas, pharmacists are now selling some of the drugs under the table at inflated prices. Many pharmacies have responded by putting away contraceptive products from their shelves and some shop closed completely. According to some of the pharmacies previous years, the usage of EC pills is highest during water festival and on Valentine’s Day. Even before banning contraceptives, the unmet need for family planning in Myanmar stands at 19 percent, compared to only 3 percent in neighboring Thailand. In Myanmar, MMR is 200 per 100000 live births which is one of the worst in the region, according to a recent United Nations Population Fund (UNFPA) report. Many women in Myanmar do not have access to the full range of family planning choices. As a result there is a high rate of maternal mortality. Safe abortion is permitted only for the reason to save Mother’s live. Apart from that reason, unsafe abortion carries a prison term of up to three years for the provider and seven years for the mother, causing unsafe abortions to become one of the leading causes of maternal death. We can imagine what will happen if contraceptives including Emergency Contraceptive pills cannot be accessed when it is needed the most and when the option for safe abortion is not available. As we always believe and advocate as young women champions, getting information and services about Sexual and Reproductive Health which are affordable, accessible and having a wide range of contraceptive options available, is our RIGHT. But where are our sexual rights and reproductive rights now?? What if young women got Sexually Transmitted Diseases and HIV because they did not have access to condoms?What if young women suffered from complications of unsafe abortion because Emergency Contraceptive pills were not accessible?? What if young women lose their lives because of septic abortion?? It would be too late to correct when she is already living with HIV, when a life is already gone!! These thoughts remind me as well as force me that I have a long way to go concerning about advocating for the young women to enjoy their Sexual and Reproductive Health and Rights. I agree with you !! 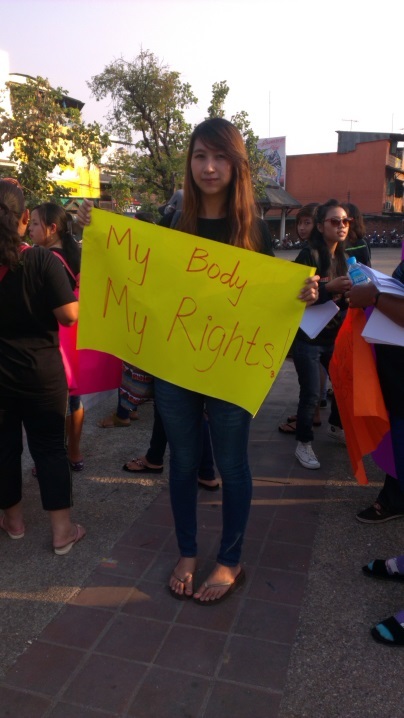 Our bodies our rights.